Don’t be intimidated by making your own candied orange peel – it’s not difficult; you just need a sharp knife and an extra dose of patience. In a large bowl, using an electric mixer, beat the butter until creamy. Add ¾ cup (150g) of the sugar and beat at medium speed until fluffy. Beat in the egg yolk and vanilla. At low speed, beat in the flour and salt. Gather the dough into a ball and shape it into 2 logs, each about 1 ½ inches (3.75cm) in diameter. Roll the logs in the remaining ¼ cup (50g) of sugar*. Wrap in plastic and refrigerate until firm, about 1 hour. Using a thin, sharp knife, slice the logs ¼ inch (0.6cm) thick. Arrange the slices on prepared sheets and press a few slivers of candied orange peel in the center of each. Bake the cookies on the upper and lower racks of the oven for about 22 minutes, until golden around the edges and on the bottom; shift the pans from front to back and top to bottom halfway through baking - I preferred to bake one sheet at a time. Let the cookies cool for 10 minutes on the baking sheets, then transfer them to wire racks to cool completely. * the dough was too sticky to be rolled in sugar so I just sprinkled it around the baking paper and shaped the dough into a log, sprinkling a little extra over the log before wrapping it – I ended up using less than ¼ cup sugar. 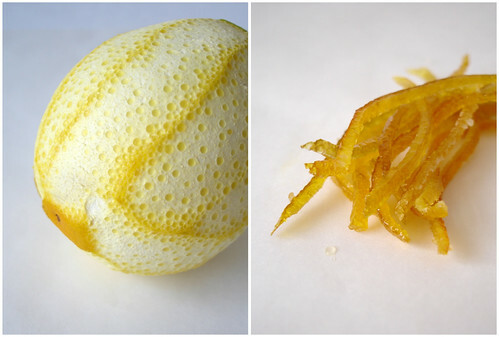 With a vegetable peeler, remove strips of peel 1 inch (2.5cm) wide from the oranges, cutting lengthwise down the fruit. Remove just the colorful outer peel, leaving behind the bitter white pith. using a very sharp knife, slice the peel lengthwise into very thin strips no wider than a toothpick. Put the strips of peel in a small, nonreactive saucepan, add enough water to cover them by a few inches and bring to a boil. Reduce to a gentle boil and cook for 15 minutes. Remove from the heat, strain the peel and rinse with fresh water. Combine the 2 cups water, sugar, corn syrup and salt in the saucepan. Fit the pan with a candy thermometer and bring to a boil. Add the blanched peel, reduce the heat and cook at a very low boil for about 25 minutes, until the thermometer reads 110ºC/230ºF. Turn off the heat and let the peel cool in the syrup. Once cool, lift the peel out of the syrup with a fork, letting the syrup drain away – some of the peel got stuck in the bottom of the pan and I could remove them by quickly reheating the syrup. Place the strips separately, side by side, on a large baking sheet lined with baking paper and let them dry overnight – if you won’t use all the peel, leave them in the syrup and store in the refrigerator for up to 2 months. Beautiful cookies, I can almost smell the citrus! Those look delicious! I'll have to try this with the next thing I candy. Ooo, Patricia, these cookies look incredible. I'm loving that they require candied orange peel. I made candied orange peel for the first time recently, and it was jut a blast!! It's so easy to make for yourself. I can't wait to use some of my peel in this recipe. Lovely! A real sophisticated touch to sugar cookies. So lovely! 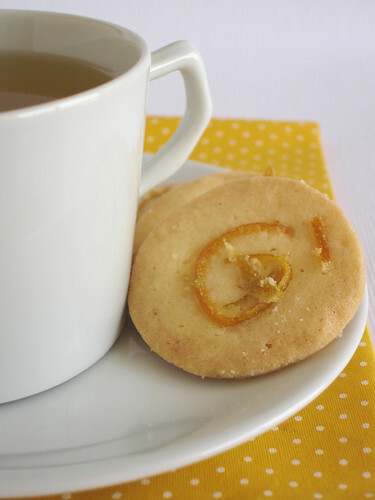 The cookies are practically screaming to a cup of black tea! I've been meaning to make my own peel for a while. For some reason it always seems a bit daunting. I'm going to try it! Great cookies Patricia. Natalie, I loved it how the peel worked really well with the buttery dough. Mark, as I used a vegetable peeler, there was no pith, but that is great to know, my friend, tks! Anna, I hope you try it! Heather, I agree with you, they really look more sophisticated than regular sugar cookies. Miss Kate, you are right! Tks for stopping by! Syrie, it's not daunting at all, darling! 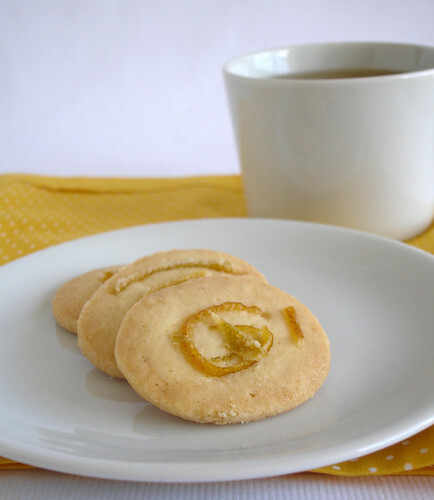 I love citrus in sugar cookies, and adding the candied peel seems like a super idea to add the citrus flavor and another texture to the cookie. Love it! You are just a whiz when it comes to creating delicious citrus desserts, Patricia. I'm gonna be posting on orange cookies soon, and I'll definitely mention these. Happy Monday! Candied citrus also makes for a great garnish on other desserts, I've been making a lot of it lately! Oooh! I just candied some orange peel spirals and zest for mini cheesecake bites. I think I could fall in love with those cookies!